I just got the grill brush from Grill Brush Pro and tried it out over the weekend. This brush does a great job of cleaning the grill. It has a long handle which allows you to get a good grip on it when cleaning. The handle also has a high quality plastic on it that makes gripping and cleaning easier on your hands. I don’t know how many times I’ve hurt my hand trying to clean the grill. The bristles are very firm and sturdy so they can really get in there and clean those stuck on spots. I was able to get some really tough spots off really easy using this brush. With this brush cleaning the grill was quick and easy! I have used several different brushes in the past and I have to say this one has been my favorite so far. The thing I love about this one is the design though, instead of the traditional triangle design it has 3 rows of bristles coming down. It makes the cleaning process more fluid. This is a seriously awesome grill brush. It is by far the sturdiest grill brush you will ever own and makes a great gift for the grill-master in your family. It is well-designed, very sturdy and super long lasting. It should last several years and won’t leave bristles behind. The 18″ handle is long enough that, even when the grill is on or is still hot, you can feel comfortable that you will not scorch your clothing or arm hair during the grill-cleaning process. This is the mean machine of grill brushes! It cleans like magic. No need for muscle with this one – it does all the work for you. This grill brush cleans all the nasty grime, grease and grizzle that sticks on your grill grate with ease and really gets in the nooks and crannies to clean every bit of your grill. Dip the brush in a cup of water and it makes a great steam cleaner for your grill. The cleaning area of the brush head is quite large, so it takes less effort to clean a larger area. The brush does a great job of getting in between the grates and underneath. 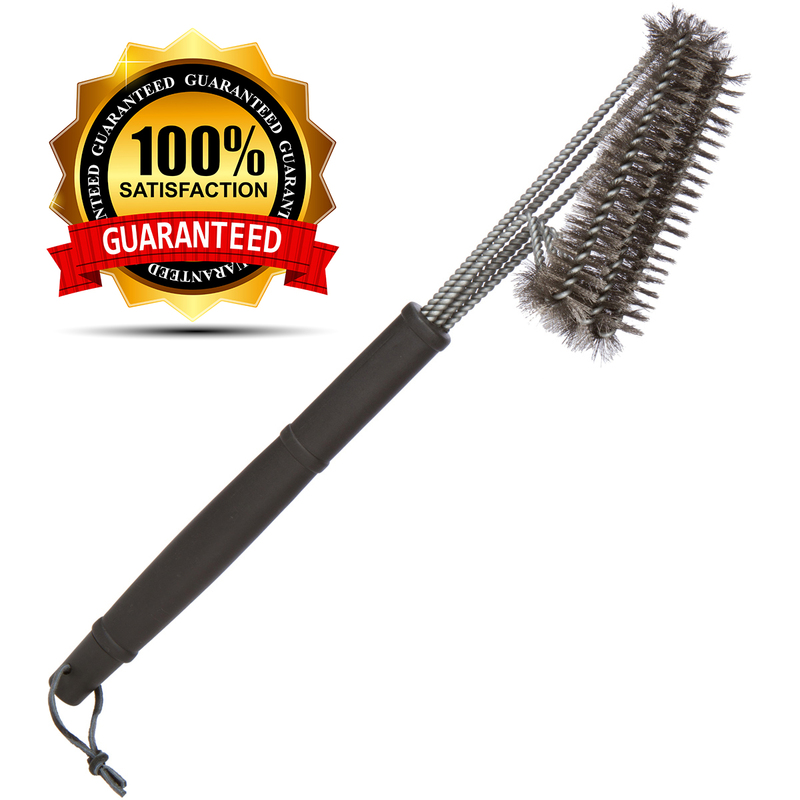 A few passes of this grill brush and your grill is ready for use. Order now with peace of mind due to our 60-day “better than money back” guarantee. No catches. See product description below for more info.